Windmills of Your Mind…except that these are real windmills sitting on the marshlands where the Maas and Lek river meet somewhere east of Rotterdam. Hubby and I really wanted to find the Holland of dikes and canals lined by quaint Dutch towns as portrayed in the old paintings. These still exist but one has to get away from the modern bustling city centers of Amsterdam and Rotterdam and explore the place by bicycle or boat. 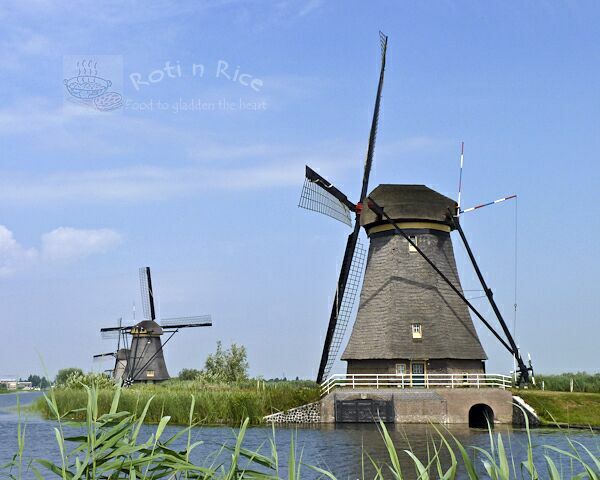 With this in mind, we settled on staying at the old canal city of Delft in South Holland about an hour away by train from Amsterdam. Delft’s old city center is encircled by several canals. 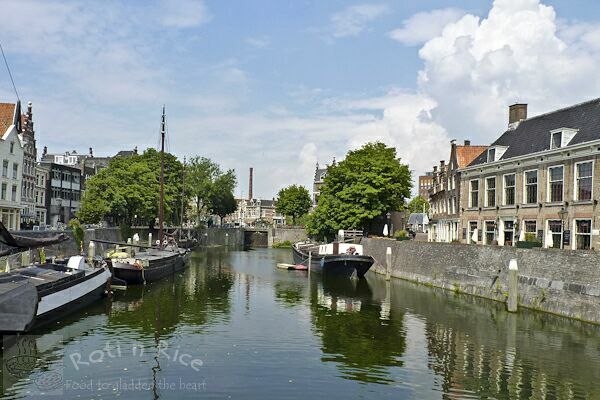 Some like the Oude Delft canal dates back to the 14th century. Beyond the boundaries of these waterways stretches modern and industrial Delft. In the old days, entrance to the city was guarded by eight fortified gates. 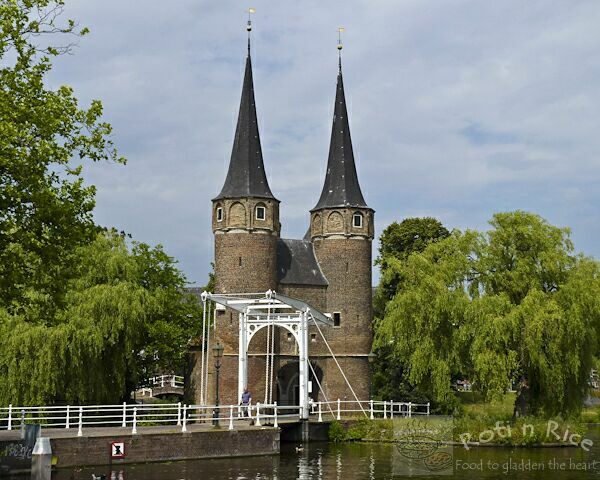 This is Oostpoort (East Gate) complete with drawbridge for allowing boat traffic through. Today, the Oostport is an idyllic part of Delft. It is a haunt for pigeons and tourists. We stayed at the Grand Canal Hotel, situated at the intersection of the oldest surviving bridge in the city (circa 1592) and the Oude Delft canal. The building itself dates back several centuries, once serving as the town jail and later as a warehouse for the Dutch East India Company. In the 19th and 20th centuries it was a private residence . Old Delft is best explored on foot or by bicycle as most places are within 10 minutes walking distance. You get the most beautiful vignettes that would have been missed if one was just motoring down the street. This street lines the Oude Langendijk canal behind the Nieuwe Kerk (New Church), complete with small deli and antique shops. 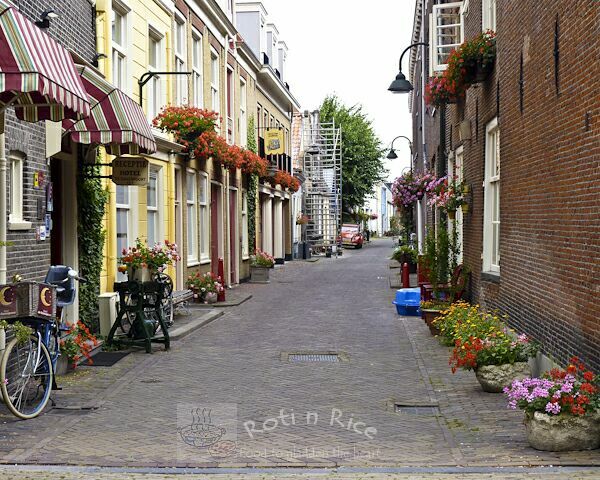 Many residential streets have a very intimate feel to them, all nicely spruced up with flower baskets in the summer. Note the ubiquitous bicycle, the King-of-the-Road in the Netherlands. All that walking around makes one hungry, so we headed to a leafy square called Beesten Markt (Cattle Market) which is ringed by some of the best-known restaurants in Delft. 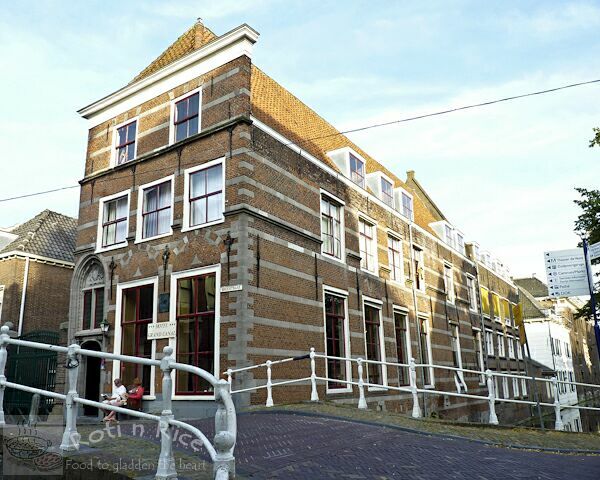 The Spijshuis de Dis is a restaurant that specializes in modern Dutch cuisine. The interior is very Old World and so tempting, but since this is summer we had a table under the trees in the square. For dinner, we ordered Het Sleepnet voor Twee (The Trawl for Two). 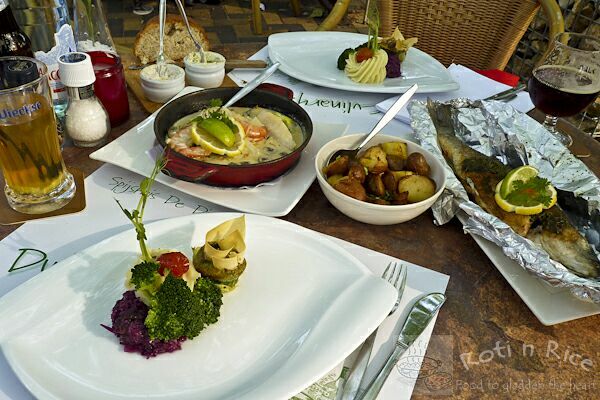 This came with a fish stew with salmon, cod, whitefish and shrimps cooked in milk, a baked sea bass in herbs, roasted potatoes, and a vegetable platter. Simply delicious washed down with local dark beer! 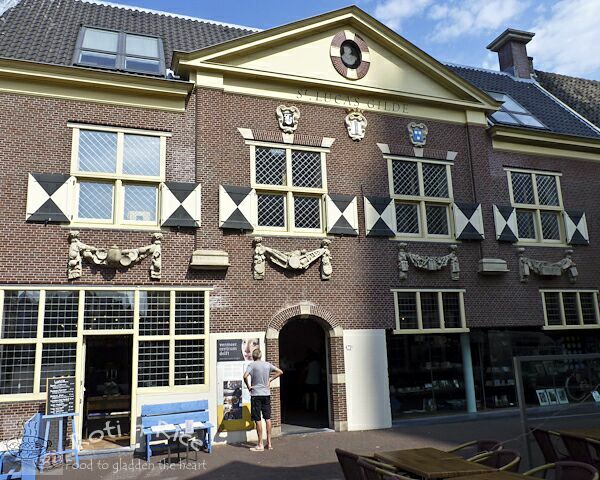 Delft’s most well known son, the Dutch Master painter Johannes Vermeer is the toast of town here. 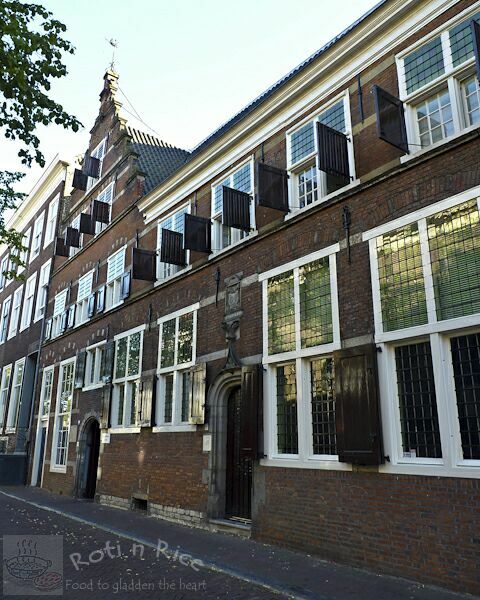 The former Artist’s Guild where he used to hang out with his friends to talk about the art market over several beers is today a museum dedicated to him, called the Vermeer Center. The heart of the old city is centered around a large square called the Markt (the Market) lined with souvenir shops and restaurants. On Thursdays you have the weekly flea market. There are two very prominent buildings that bound the square at each end. 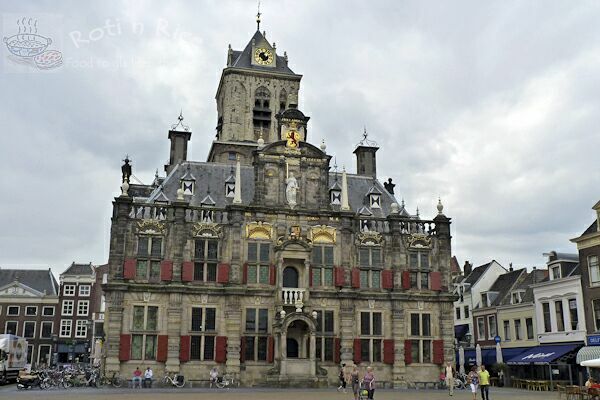 This one is the Stadhuis (Town Hall). At the other end of the Markt is Nieuwe Kerk (New Church), new being a relative term since it was built in 1396. 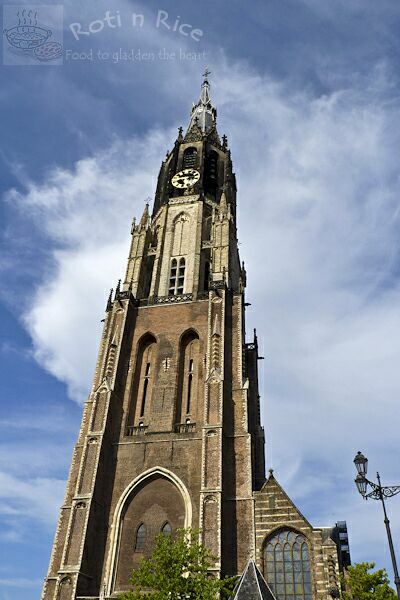 The spire is about 357 feet tall and it is the royal burial crypt of the Dutch royalty, the most recent being the late Queen Juliana in 2004. 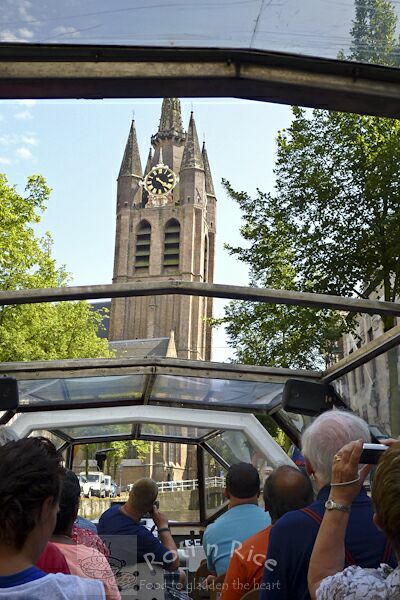 A good way to explore Delft is by the canal boat tour. Here we were approaching the Oude Kerk (Old Church), a leaning tower built in the 1246. It is 246 feet tall and slightly more than 6 feet off center. Johannes Vermeer, and the scientist Anton van Leeuwenhoek were buried in this church together with many other prominent citizens of Delft. In the 17th and 18th centuries, Delft’s wealth was hugely contributed by the local chapter of the Vereenigde Oost-Indische Compagnie (Dutch East India Company). This is the former premise of the company built in 1631 just across the canal from our hotel. What is a visit to Holland without cheese? 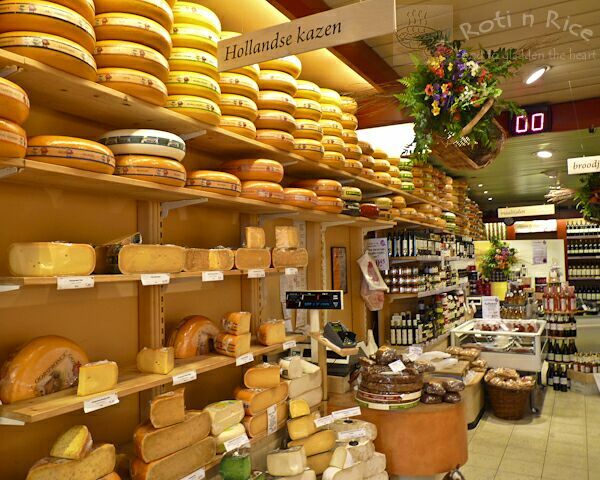 The shelves are just lined with all sorts of Gouda and Leidse. You get to taste them too! After several days in Delft, we decided to venture out to Rotterdam. 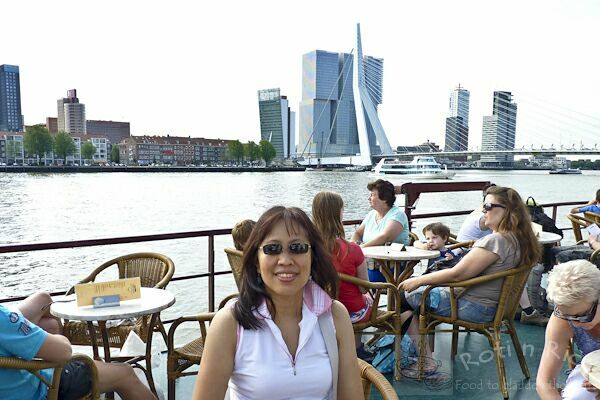 We took a river cruise on the Maas River towards Kinderdijk. In the background is the Eramusbruge, a landmark of Rotterdam. 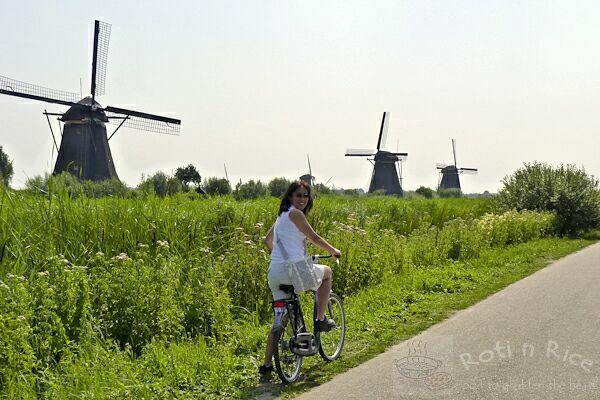 At Kinderdijk, we rented bicycles to explore the nineteen windmills dating back to the mid-18th century. The Unesco Heritage site is a must-see. The easiest way to get there is by this cruise (twice a day) or by the Waterbus service. Back in Rotterdam, we explored the waterfront and west side of the city. 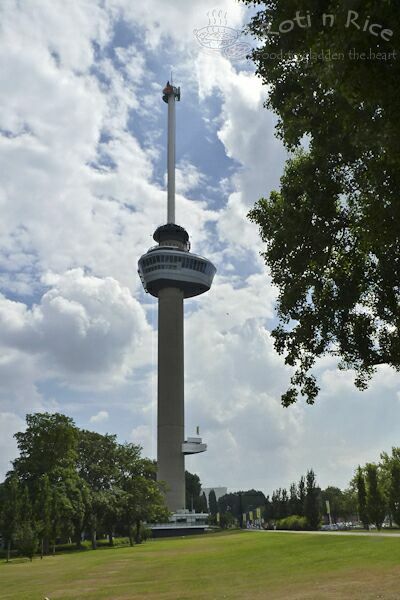 This is the Euromast, a landmark in Rotterdam. Even modern Rotterdam has a bit of her history to be found here in Delfshaven, the port from which the first group of Pilgrims made their attempt to reach America. 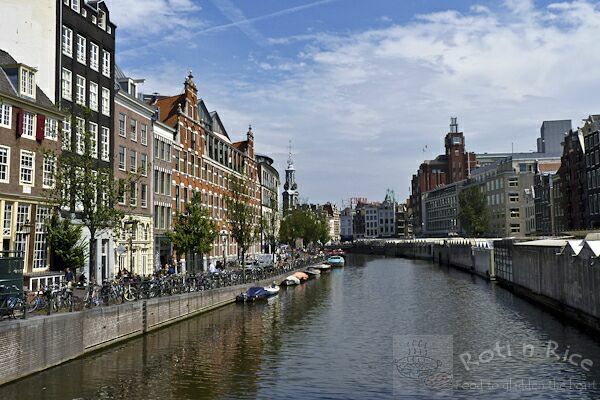 No visit to the Netherlands is complete without a stopover at the largest city, Amsterdam. Here we see the Singel canal running along the Bloemenmarkt (Flower Market). If you happen to be a tulip fan, this is one place to be in bloom heaven. 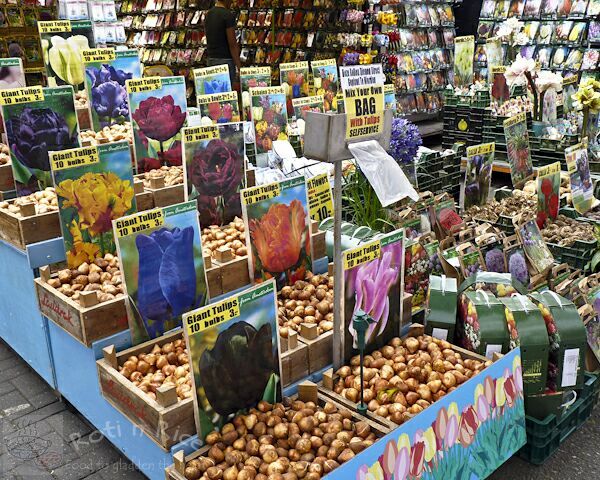 In the Bloemenmarkt (Flower Market), bulbs for tulips of every shade and shape can be found. Being a foodie, all that bulb gazing only makes one hungry. 😎 We headed to the Park Plaza Brasserie opposite the Central Train Station for some delicious Dutch pancake with stroop (dark golden brown syrup) and apple strudel. It’s OK. We get to walk it off, right? The next thing was to go on yet ANOTHER canal tour, a quick and easy way to see a lot of Amsterdam. 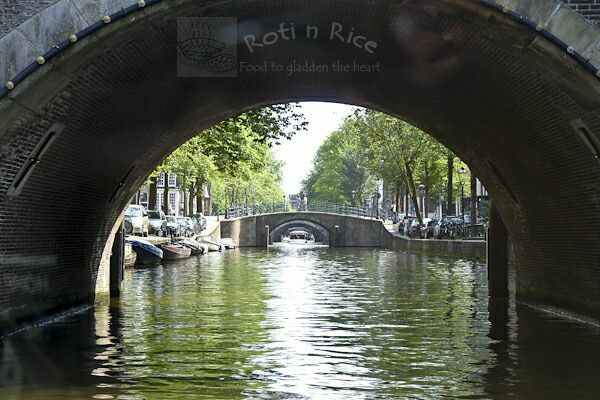 Here we get a boat’s eye view of Amsterdam. 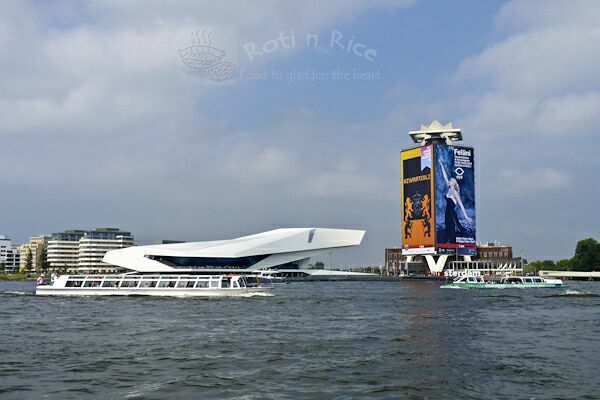 That cool-looking building there is called the EYE, home of the Film Institute of the Netherlands. Sailing around makes one hungry. 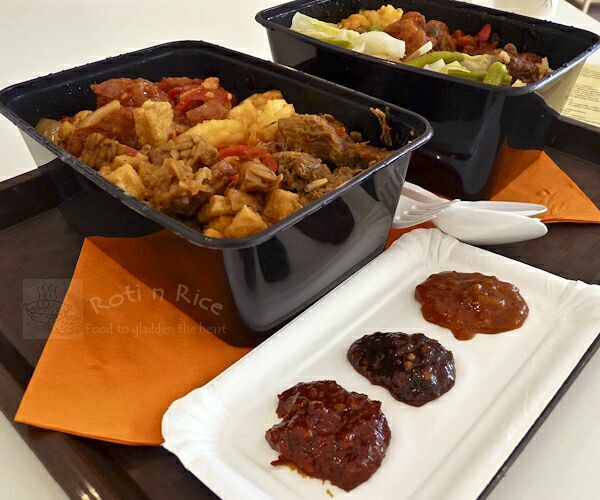 This time we went to have Nasi Rames at a Surinamese-Indonesian restaurant called Toko Joyce. The curries and condiments are a real cure for those missing Asian food, especially the spicy variety. They even gave us a sampling of three different sambal flavors. With that satisfying ending, we were ready to take that flight back to the USA! Great photo tour! The pancakes looked especially inviting and I’m curious about the tulip bulbs – are you allowed to bring them into the US? Loved seeing all the pictures and commentary of your trip! I was there as a child, saw the lovely tulip fields at Keukenhof but don’t remember much else. Thanks for the close-up tour! Thanks for the concern. I think I am on the mend. Biking is the way to go in the Netherlands. Would have done it more if we had more time there. Holland is a place I’ve always wanted to go. A grandfather I never knew was from there, so it’s in my ancestry. Thanks for sharing your trip and these lovely pictures! It’s just what I expected – gorgeous! Maybe you should make a trip there soon. The smaller cities are really pretty. What a lovely post, Biren. 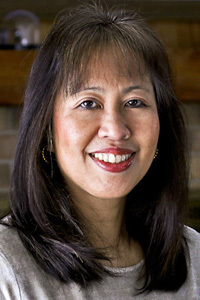 Was a week in NL sufficient? Looked like you’ve covered quite a bit of NL. 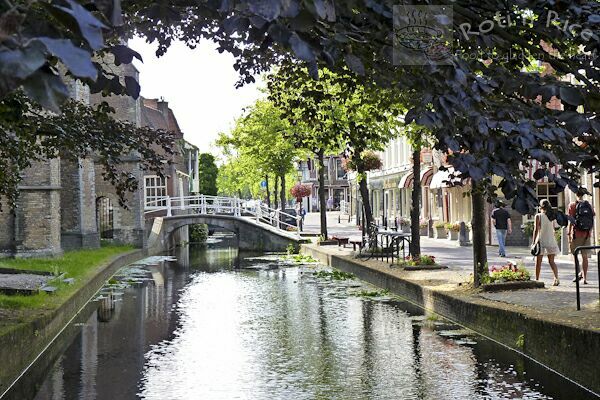 I’ve not been to Delft or Rotterdam, but would love to go there one day. I’ve been to busy Amsterdam and Maastricht. Some of the pictures and stories you mentioned reminded me of our trip to Amsterdam – the canals, the cheeses, the pancakes, the windmills, the bicycles, etc.